Lexus’ flagship LC coupe is headed to the big screen, where it will serve as the chariot of choice for Wakandan leader T’Challa. You’ll soon have your chance to buy your own version of this Marvel-commissioned coupe as part of the limited edition LC Inspiration Series. Just 100 are earmarked for the U.S.
Lexus states that the car is inspired by T’Challa himself along with his homeland of Wakanda. That’s why the LC Inspiration Series wears special Structural Blue paint, a hue that took eight months to develop. There’s no actual blue pigment used in the paint itself, yet it reflects blue light. Besides paintwork sure to give any bodyshop fits, the special edition LC is fitted with carbon fiber sill plates, a white interior, 21-inch forged wheels, and a limited-edition Barney’s sommelier set of barware. The car goes on sale in the spring of 2018 but there’s no word yet on pricing. Now, if you know who T’Challa is (and if you’ve read this far, you probably do), then you also know his other name… Black Panther. 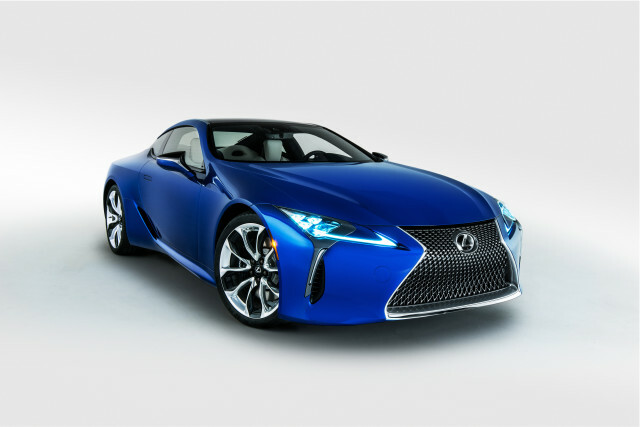 Lexus cooked up a concept vehicle for him as well. The automaker has incorporated vibranium into the construction of the car. Vibranium is a mthyical element established as part of the Marvel universe. You’ll find it used to built Captain America’s shield, the Black Panther’s suit, and a number of other story-telling devices within this universe. The Black Panther’s Lexus LC has a vibranium-powered core and a layer of vibranium weave in the body panels. The body itself has been widened a bit and the whole car seems to pulsate thanks to the underbody light kit. Lexus is having fun with the partnership, so we’re not going to tell them that vibranium isn’t real. It’s a unique way to pay tribute to this automaker-film studio mash up. While it’s fun, we actually prefer the rather striking production version above. Mahindra prepares 'brand journey' to launch passenger vehicles in U.S.